Ain't no party like a Waffle House party, and maybe no one knows that better than New Kids On The Block member Donnie Wahlberg. On July 12, Wahlberg went for a late night meal at Waffle House in Charlotte, North Carolina where the band was staying for a show in Raleigh the following night. 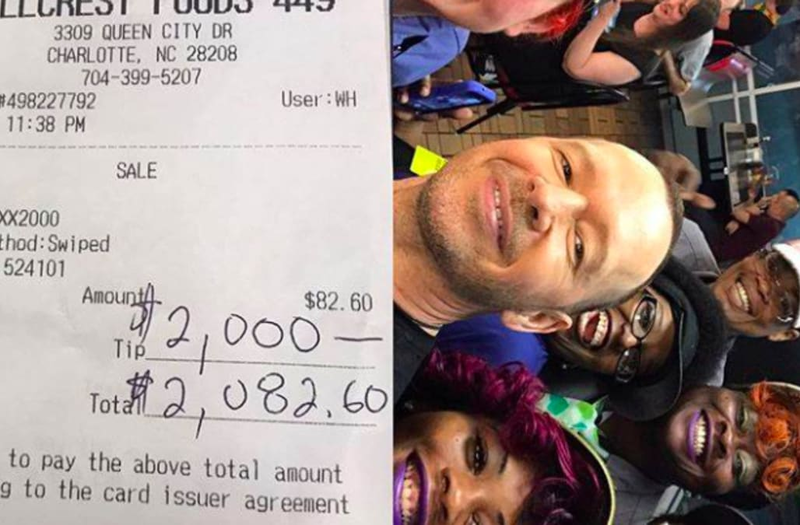 In a bill that was hefty for a Waffle House meal to begin with, Wahlberg signed the check for him and his party for $82. But when it came time to leave a tip, the staff was shocked to see a signed total of a whopping $2,082. Translation: Wahlberg left a $2,000 tip! An excited and heartfelt Wahlberg wrote, "My mom waited tables, and my dad tended bars-- for years! So, when I walk into a #WaffleHouse, and the staff treats me like a king, you better believe I treat them like queens!" The Waffle House crew looks equally as excited as Wahlberg, and we're thinking this selfie might rival Ellen DeGeneres' infamous Oscar selfie of 2014. Chivalry isn't dead and neither are all the good people — all you need is a couple of waffles to bring out the goodness in them! Anyway, if you need us, we'll be blasting (and choreographing) "You Got It" for the rest of the day.